I love a Beautiful Man on two wheels– propelled by muscle, not petrol. Feast your eyes. Patrick Dempsey. If I said he has a beautiful body, would he hold it against me? Owen Wilson on a Brompton folding bicycle. Owen is a big fan of Bromptons. The Long Suffering Hubby just got one of these and loves it! Leonardo Di Caprio in jeans and T-shirt on a Citibike in New York City. Dave from Milwaukee, of the blog Over the Bars! Lookin’ good in that suit, Dave! Liev Schreiber with the whole family on board. Uh oh, looks like he has a flat tire! Jake Gyllenhaal. Just gorgeous. Notice: TWO water bottles 🙂 And shoes with cleats that attach to the pedals. For serious cycling! Hugh Jackman on a Brompton. Give me a ride, Hugh? Heh, heh. 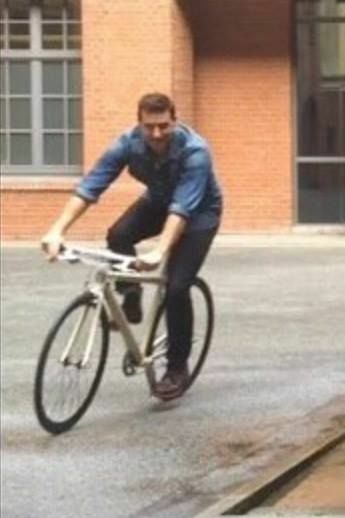 Orlando Bloom, looking Very Manly on his Mountain bike. Click for source. I saved my favorite for last: lovely Dougie Henshall at the summit of Mont Ventoux, one of the hardest climbs in the Tour de France. Photo from his Twitter account. *giggles* ah well, London, Paris and Dublin are not really made for cycling, anyway. He’s excused. They’re great walking cities, which is what he likes! Traffic there is mad. I agree with that approach (even though I go on the occasional suicide mission on my bike in Dublin, myself). Better to be safe on two feet than dead on a bike. LOL, suicide mission! I can’t imagine riding there, between all the traffic, on four wheels and pedestrian. It’s pretty hairy… Neither pedestrians nor cars like cyclists very much. And I won’t even mention the busses with whom cyclists in Dublin share the same lane. Madness! Seems like busses and bikes would not be a good mix, but I’ve seen that in other cities too! Sure, it was Jake G’s two water bottles that caught my eye first. Hee, hee! And Patrick Dempsey has got one fine derailleur! Fine choices, Linnet. Well done! Very enjoyable post 😉 Thanks! Haha! The lycra is not my favorite part, even on young men, but I suppose it’s functional. What, no pix of The Donald on a bicycle? What could be more beautiful? He probably avoids bicycles. Just think what it would do to his hair. Glad to hear you have an affinity for men on bikes! OMG, pizza and hot men on bikes. Where will this day go from here? Random leg appreciation! Now I can get on board with that 🙂 I respect that he didn’t want to dope. It really was rotting the entire sport from the inside. Hope things have changed since then. Oh, and Pierce Brosnan likes to cycle too!